Rabbitware is a combination of transfer printing and stick sponge or spatterware. 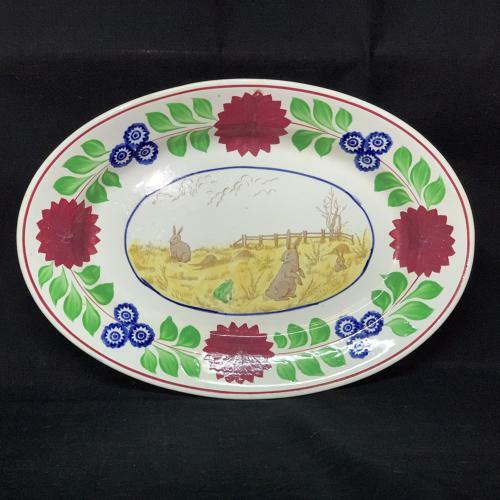 The three rabbits and frog in the center of this plate are transfer printed in brown and painted with enamels in yellow, brown and green. The border is painted in a variation of the Adams Rose and Bulls Eye patterns. The deep platter measures 14 1/2 inches long x 10 1/8 inches wide and transfer printed in brown and painted with enamels in yellow, brown and green. This folk art is a highly collected art form. No signs of use. The piece is in good condition. There is a tight hairline to the left side of the platter.